Joy Creek Photo Archive (c) all rights reserved Lamium maculatum 'Anne Greenway Sport' is a Joy Creek introduction. This reversion of 'Anne Greenway' is very close to Lamium 'Aureum' with its green gold leaves, central white bar and its off-pink flowers. It is tougher than 'Aureum' which tends to melt in our garden in the winter. 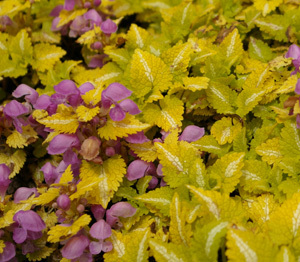 A low-mounding ground cover to lighten up the shady border. Summer. 8 in. x 3 ft.